The photo id for this photograph is 51, in the Trains and Railway Lines album. On the far right of the picture, beyond the tail end of the land rover is a small collection of huts. These housed about a dozen pigs belonging to my Dad Charles (Wag) Lomas and my uncle, Tommy Lomas. 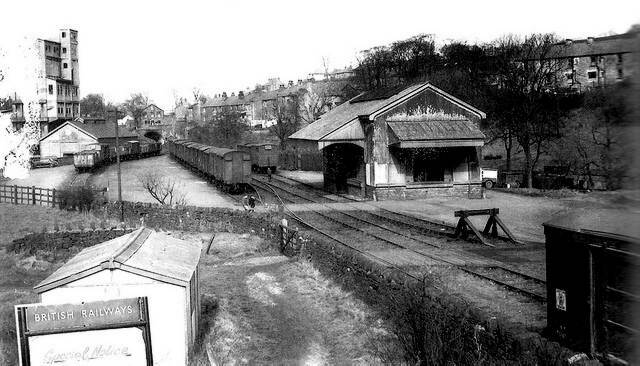 The two kids crossing the railway in the middle of the picture are, I think, myself and my brother Jeff Lomas It must have been taken in the late 50s. Thanks for that comment Lou, let's hope it is you. Purely by coincidence, only yesterday, I came across another version of this photo by J.W.Sutherland (photo 1115). What is strange is the difference in the bottom left corner in front of the shed, with a moving British Rail sign. If I had to wager which photograph is genuine I would say 1115. I trust J.W.Sutherland's version, since he took the photograph. That photograph is dated 11th March 1961, I hope that helps you.